I admit that I’ve never really loved Valentine’s day. I’m one of ”those” who believe it’s an over commercialized day which encourages us to spend money we otherwise wouldn’t out of guilt. I won’t make my husband feel bad if he doesn’t show up at home with a dozen roses and chocolates and fully expect to cook dinner . I know a lot of people who love it though. They love everything about it, making reservations at fancy restaurants months in advance. Flowers delivered to work, roses at home and chocolate for dessert. While I don’t really ”get it” I respect that as long as people are happy, the over commercialized holiday doesn’t bother me. A funny thing has happened since having a kid though. I love all holidays. I find myself wanting to celebrate every small holiday because I can make it fun for her. Kids love having fun and I love seeing my kid have fun. I’ve already bought her Valentines cards which she’s signed (scribbled all over) for her friends at daycare, and even bought her a little present. Something I never thought I would buy into, but kids just have so much fun with even the smallest of holidays I can’t help but have fun with it too. 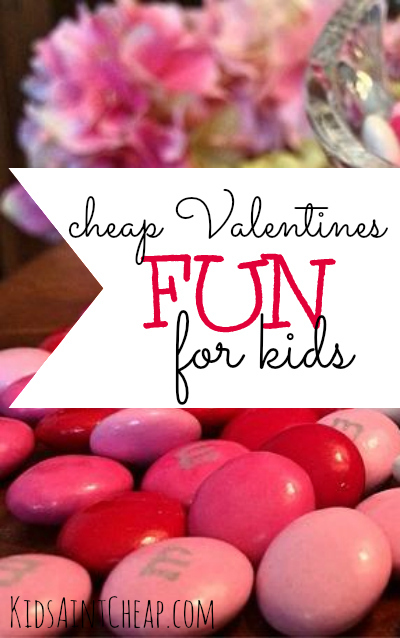 Valentines day fun with kids doesn’t have to be outrageously expensive though! We spent a total of $15 and bought her valentines cards for friends, a small chocolate, some stickers and a toy she always sees in a particular store, which we got on clearance. There’s no doubt she’ll have just as much fun with the day as the kid whose parents may have spent significantly more money. 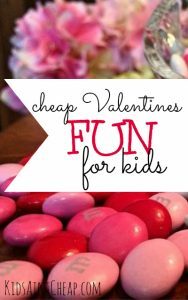 Here are a few fun, and cheap Valentines fun for kids ideas! I remember growing up, my mom once made us pancakes and cut them with a heart-shaped cookie cutter. I, to this day, don’t love pancakes but those heart-shaped chocolate chip pink pancakes were delicious! This would work for french toast as well. Adding a small drop of red food coloring in milk to make pink milk might be a fun idea as well. Paper doilies and sprinkling powdered sugar over the pancakes or toast also gives a pretty design that is sure to impress kids. Every kid has a favorite treat. Spending time to make their favorite dessert or treat is a nice gesture. If you don’t have time (or baking skills) to make the treat pick it up in store. Family fun doesn’t have to involve going out to spend more money. Spend Valentines Day with the family at home over a nice meal and some form of family fun. I plan on finding a few Valentines Day printables on the internet and giving the kid some crayons to go nuts with. She loves having us sit beside her and help her play with crayons. Might not be super romantic but she’ll have fun and when you have kids, as long as they’re having fun you’ll be happy! Do you have any fun plans for your kids Valentines Day events?